Hyundai Tucson | Cars by Hyundai care by Popular. Enjoy the moments of brilliance in every day journey with fun & dynamic driving experience that makes each day special. The all new Hyundai Tucson ensures the highest level of safety with advance high strength steel and 6 airbags for driver and passengers which enhance the dynamic driving experience. Drive comfortable any where any time. From the landscapes to the rocky mountains, seize the best moments in the all new Hyundai Tucson. The all new Tucson features LED day time running lamps with integrated fog lamps on the front and the rear lamp is exquisitely fused together to the rear bumper, giving functional elegance with practical safety. Sporty roof rails, shark fin antenna & two tone side garnish gives the Tucson a refined and sporty look. Enjoy total comfort in the all new Tucson with its plush interiors, generous front and rear leg room and ample shoulder room for all passengers. 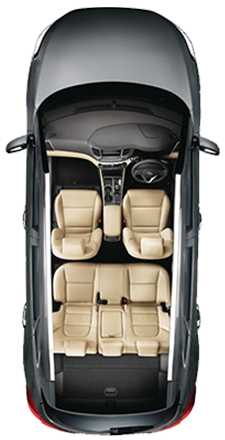 The range of premium interior features of the Tucson provides premium comfort in every way. Feel the ultimate driving experience with the all new Hyundai Tucson. Enrich your driving experience by choosing from four different variants. The Tucson come with Nu 2.0 six speed petrol ( manual / automatic ) & the R 2.0 six speed ( manual / automatic ) which is assisted by driver mode select and flex steer for manual transmission. 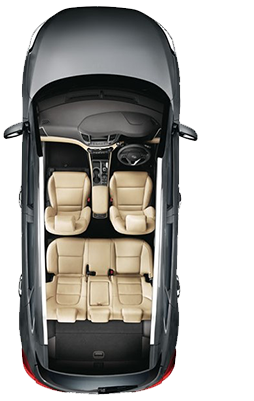 The family oriented design of the all new Tucson gives voluminous space without boundaries. Convenience and comfort synced with practicality is the design theme of this SUV. 10 way adjustable driver seat, hands free power tailgate, smart parking assist system, supervision cluster with 4.2” TFT LCD, 8.0 HD smart infotainment system & ECM with compass, auto defogging system, dual zone auto temperature control, electrically foldable and heated ORVMs etc are some of the features. The all new Tucson features a wide range of active and passive safety measures. The all around six airbag system with front and side curtain airbags, three point ELR seat belt at the rear, height adjustable seat belts, state of the art electric parking brake & speed sensing auto door lock are some of the features which ensures safe and intelligent driving with greater rigidity through cutting edge technology.